AUSXIP Renee O'Connor News - Happy Birthday Renee and Message From Renee! Happy Birthday Renee and Message From Renee! 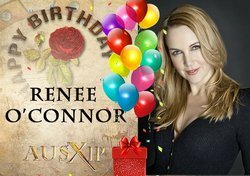 AUSXIP wishes the INCREDIBLE and SUPER TALENTED #ReneeOConnor a HUGE Happy Birthday! Actress Writer, Director, Producer. AUSXIP Talking Xena has a thread open for you to send Renee birthday wishes! Click here for more info! Thank you for all the birthday wishes! I am grateful for all your blessings. Really looking forward to hearing from everyone on Monday. Please send me any questions. I have a few so far. Be well friends!